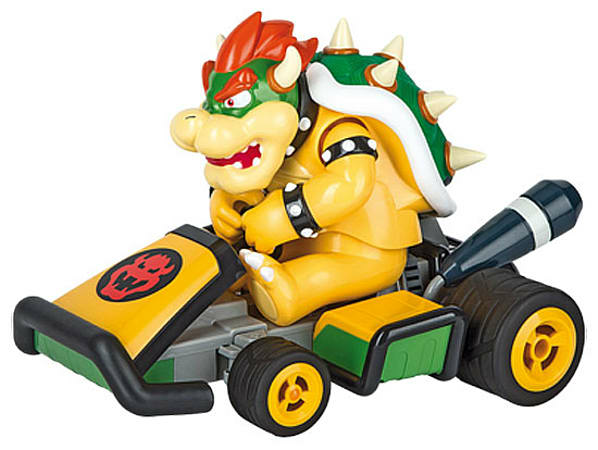 Take charge of every high-speed situation with Carrera RC's Bowser from the well-known Mario Kart TM7 game! The powerful Li-Ion battery facilitates up to 40 minutes of high-octane action and fun, and after just 80 minutes of recharging it's time for action and top speeds of up to 20 km/h once again! Even driving in reverse looks good in this remote controlled car. With the ergonomic controller in your hands everything stays under control. Servo Tronic technology and differential gears help to guarantee precise steering and control. And you can start immediately! The Carrera RC Bowser Kart is supplied with 9V batteries, a power pack, controller and recharger – so it's Ready to Run and you're ready for fun!